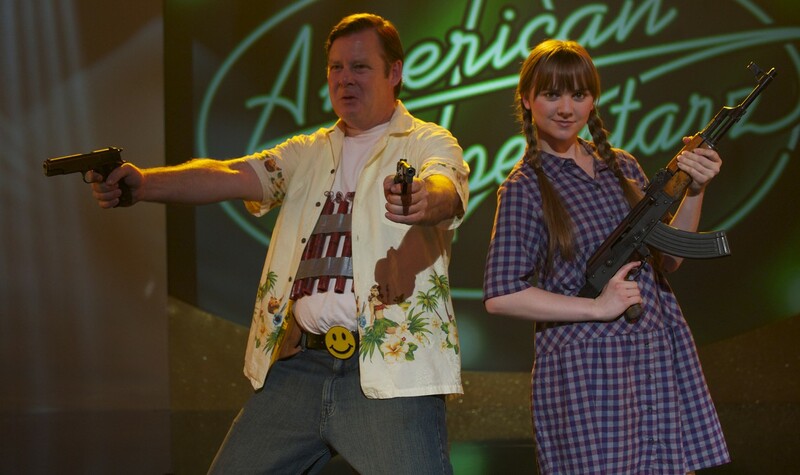 Frank (Joel Murray) has had enough of the downward spiral of American culture. Divorced, recently fi red, and (possibly) terminally ill, Frank truly has nothing left to live for. Instead of taking his own life, he buys a gun and decides to take out his frustration on the cruelest, stupidest, most intolerant people he can imagine starting with some particularly odious reality television stars. Frank fi nds an unusual accomplice in a high-school student named Roxy (Tara Lynne Barr), who shares his sense of rage and disenfranchisement. Together they embark on a nationwide assault on our country’s most irritating celebrities. Written and directed by taboo-busting fi lmmaker and comedian Bobcat Goldthwait (Shakes the Clown, Sleeping Dogs Lie, World’s Greatest Dad), God Bless America is a truly dark and very funny comedy for anyone who’s had enough of the dumbing down of our society. OPENING NIGHT AFTER-PARTY FOLLOWING SCREENING!! Please join us after the screening for live music from Calgary's Agnostic Phibes Rhythm & Blood Conspiracy, Djewel, drinks and food at Local 522 (located at 522-6 Ave SW). Your screening ticket is your entry to the party, subject to capacity. "God Bless America may be the one film this year that has me most worried for my future, unborn children"
"When it comes to molotov cocktail-like fi lm premesis, perhaps none are greater, more deliciously wicked than comedian turned filmmaker Bobcat Goldthwait’s incendiary and hilarious societal screeds"
Director Bobcat Goldthwait and Joel Murray in attendance!